Women's Original Gloss Chelsea Boots is rated 4.3 out of 5 by 91. Rated 3 out of 5 by paigedb from Slightly Disappointed These boots are very cute! Kept my feet dry on a rainy day, comfortable, and fit well. However the rubber inside both boots has already cracked behind the elastic part after wearing the boots only a few times. I have had a different style of hunter boots before and did not have this issue. I am disappointed because for the price I expected better quality. Rated 2 out of 5 by Stormy1185 from Really rubs on legs! I really want to love these boots but they hurt so bad! The tops of the boots really rub against my legs, to the point that I had to take them off. I’m keeping them in hopes they loosen up a bit. I would not recommend. Rated 5 out of 5 by Janels from Great quality Love them! Everyone needs to have a pair! Don't think twice about it! Rated 5 out of 5 by cass from 10/10 someone posted a pic of these on VSCO and i saw them and had to have them. bought them as a christmas gift for myself and love them. i wear them all the time and get tons of compliments. 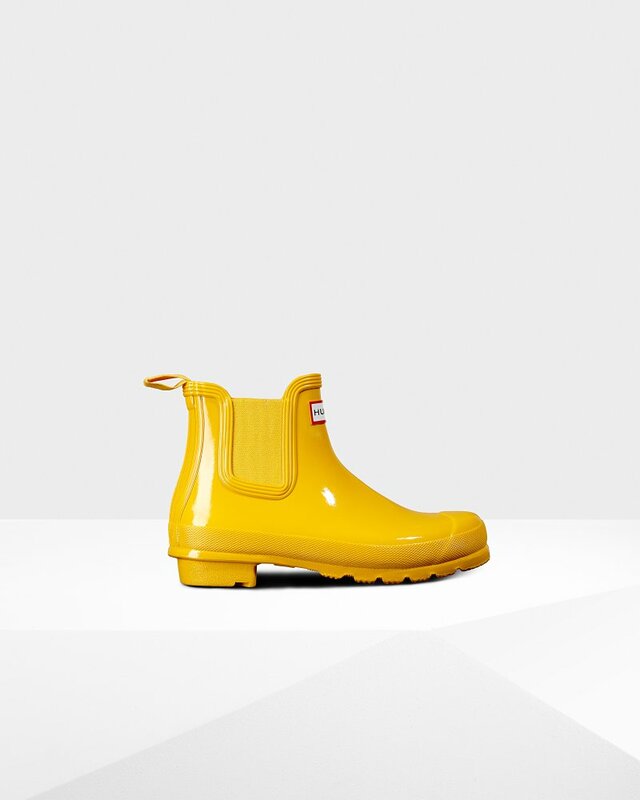 mine are bright yellow and add some sunshine to my darkest days. thanks hunter boots. Rated 3 out of 5 by selahrose from cute boots, dont last i bought these boots in November and i love them! they're so cute and have become a staple in my wardrobe this wet winter.. however the rubber on the heel is splitting open, i'm disappointed as these wellies aren't cheap. i've wanted a pair for so long and its disappointing that they are already falling apart. Rated 1 out of 5 by Melinda from Who are these boots made for? I could barely get my foot into the boot. Sizing on my foot was fine once my foot was in it but I couldn't get my feet in and out of it. Who does this boot work for? Maybe someone with flat feet. If you have an arch then you can't get the boot on. So disappointing.